Floods are more dangerous than one may think. They can be fast like lightning and are strong enough to cause a lot of damage. Part of what makes floods so dangerous is their ability to cover vast amounts of land in short periods of time. Floods can also cause mudslides and avalanches in mountainous regions. In the small country of Bangladesh, in Asia, thousands of people die every year because of floods. Here, water can rise so high that people have to travel by boats to get to their homes. Similarly, floods are problematic in the United States. Every year, they cause $4 billion worth of damage and kill an average of 146 people in the United States. This is twice as many people killed annually by tornadoes. 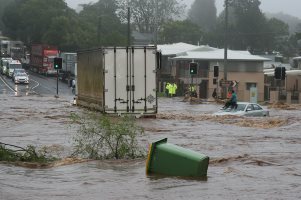 Flood waters are so damaging because they are very forceful. While water rises, its currents can even carry houses away. With only two feet of water, a powerful flood can overturn a car. When floods occur, people should not drink or come in contact with polluted flood water. Rather, they should store enough clean drinking water and food to last out the storm.